It is so good to be a year old. To be able to look this cute and not even realize it. 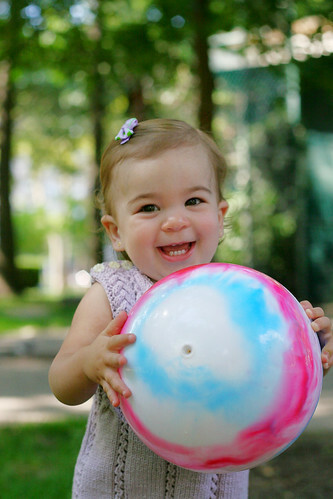 To be able to find happiness in a ball and squeel with delight and to be SO adoreable doing it! I made this dress for a dear friend who helped me tremendously before my wedding. I never got to photograph it with a model until today when we went out for a little photoshoot with her cutie daughter, Leyla. She, dear friends, is a natural. She was so calm and really knew how to work the camera. As for the dress, I used a heavier weight for this pattern but I think we can all agree that Calmer is like the absolute go-to yarn! It's got such great give and it's so soft. It's really the perfect toddler yarn. Leyla enjoyed playing in the park and I enjoyed hanging out with her and her wonderful parents. adorable!!! that little dress is gorgeous, and the model is such a super cutie. Great job!! She is so stinkin’ adorable! The dress is too! 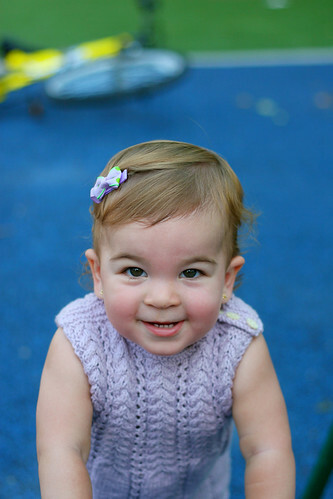 So incredibly cute: both Leyla and her little violet dress! Oh. She’s so cute it makes my ovaries twinge! Especially in that dress – nice work! OMG, she is so delicious! That grin, those chubby legs, her adorable dress… NOM! That is, without a doubt, the best use of Calmer ever. And Leyla is so adorable. Little Leyla is just breathtaking! I bought Vintage Baby Knits yesterday! Must say a new favorite of mine! What a buy so many patterns and with each turn of the page it gets better! Love when a knitting book is just full of ideas and promise! Great job on the dress, love the color and it looks simply adorable! That little dress is so adorable and so is the model! 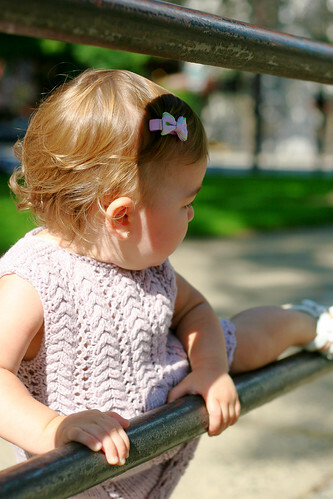 I wish my daughter would hurry up and have some children…Was that photographed in Wright Park in Tacoma? No, we were at my neighborhood park in Hoboken! Thanks for all the love on the dress! I really like how the lines between the cables bunched up with the heavier yarn. It gives it a snuggly, cabley look. I almost didn’t recognize the pattern.